Sets of 5, not 4. Have you ever noticed that, in Japan, they offer sets of 5 things not sets of 4? Here, in the West, a set of 4 of anything is common but, in Japan, it is much more likely to be 5 of that same item, such as the 5 pairs of chopsticks below. The reason for this is that the word for the number 4 is pronounced as “shi” but the word for “death” is also pronounced “shi” and this connection with death means that it is considered bad luck to have sets of 4 things. I have added lots and lots of furoshiki to my wafuku.co.uk website. Most are contemporary ones, some with images such as Hokusai’s Great Wave & Fuji and his Red Fuji print, some with charming bunnies, a range with a black & white cat in typical Japanese settings and many other delightful designs. There are also some bigger, vintage old stock furoshiki just added and another mixed variety of vintage ones to be added soon. Furoshiki are traditional Japanese wrapping cloths. Instead of wrapping paper, these cloths, which come in various sizes, are wrapped around objects and tied in specific ways. The Japanese are, of course, renowned for their clever and specific ways of folding tying things and they have developed a myriad of ways to use and tie furoshiki. I previously wrote a blog post about furoshiki, showing many, many ways to tie them. You can check out that post and the diagrams here. A few furoshiki tying examples (lots more here). Some Japanese school buses are a joy to see. Wouldn’t going to school, or anywhere, be much more tempting if you could get on a Hello Kitty bus or a Catbus or something bright, colourful, cheerful and fun? In Japan they revel in the joys of kawaii (cuteness). They don’t feel it is too childish or feminine for anything or anyone, so you see it everywhere, from toys to transport to advertising to traffic cones to logos and mascots, even their police forces have kawaii mascots. They know it can lift the spirits and get across a message well. Seeing these cute buses on our streets would lift my spirits a lot, despite my lack of youth. I especially love that particular cat and the steam train. Even Thomas The Tank Engine made it to Japan. A nice variety of animals. You don’t get more kawaii than Hello Kitty. Pokemon was inevitable and the plane is very effective, despite having no wings. There had to be a bear. Catbus looks a little dangerous to drive with that big head attached to the front. Catbus is from the sweet anime story, “My Neighbour Totoro”. Check out the colour of its tyres. 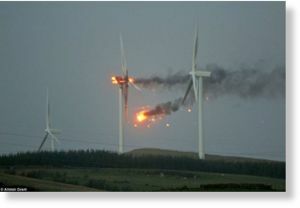 Please note that any advertisements shown below my posts are put there by WordPress, not by me. I am not responsible for whatever product or service is advertised and its being there does not mean that I back or recommend it. In my last blog post I included a video clip showing the appplication of a fluid, presumably something like latex adhesive, that makes the single Japanese eyelid fold when opened, giving the appearance of a double eyelid, more like western world eyes. This is popular, whether done with a liquid or tape application or with more drastic cosmetic surgery, because it makes the eyes look bigger. A current trend in Japan is anime/manga style eyes, which are achieved by combining the added crease with contact lenses that make the iris and pupil much bigger, giving the larger than life, cartoon like eyes. I have to admit that some of them scare me a little, the eyes look inordinately large for the face, but I also find it an interesting look that can suit the Japanese face, though I do not like it so much if the eye enlargement involved surgery rather than the more temporary options. If you flike the idea of going out in fancy dress as a manga or anime character, this video shows you how to apply anime make up, with the huge cartoon eyes and tiny lips. In case you are unsure, manga is Japanese comic book illustrations and anime is motion cartoons, both of the same style. Now, if you want to go even further and have really freaky eyes, check out the contact lenses in the photos below, and many more very weird ones, here. I really like lots of those and wish I was young enough to carry them off. 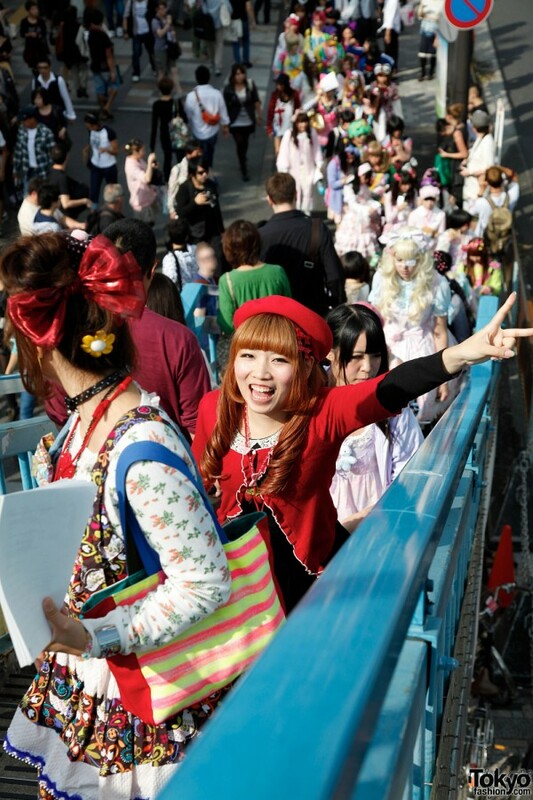 A site I really like is TokyoFashion.com, where you can see masses of photos of street fashion in Tokyo, with a lot of focus on Harajuku fashion (trends from Harajuku, in the Shibuya ward of Tokyo). You will see a lot of girls with anime eyes in those photos too. On that site, you find photos of people in the street in fabulous, creative outfits, many a mix of western fashion, vintage fashion and contemporary versions of traditional Japanese styles. There is also some Tokyo fashion show news. I like the people on the street stuff best. The fashion shows have mostly western women modelling, many of whom have legs so thin that it looks as though their thighs would snap like twigs, whichI find repellant; I thought the days of concentration camp-like models were coming to an end but it seems it is not. I also get a touch creeped out by the fashion that makes girls look like very young children, practically toddlers. It’s cute but slightly disturbing. 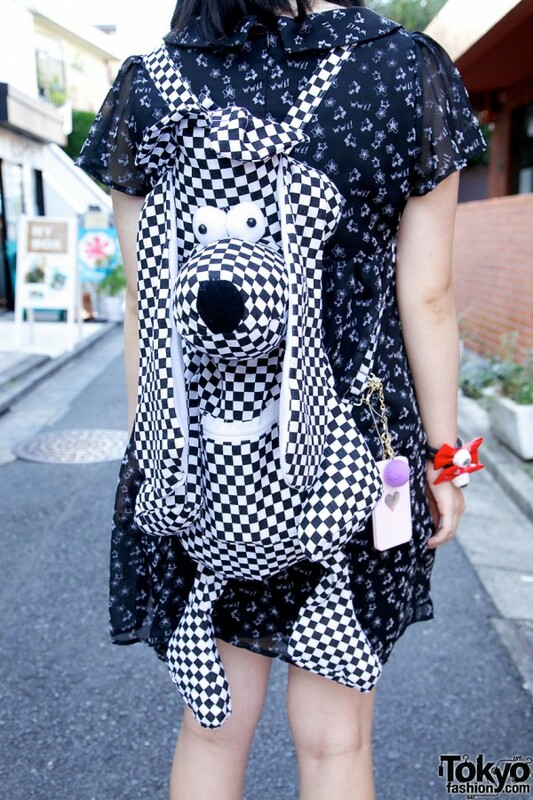 I do, however, love most of the quirky fashion in Japan. and these tattoo tights. There are lots of great tights and socks in the photos on that site. 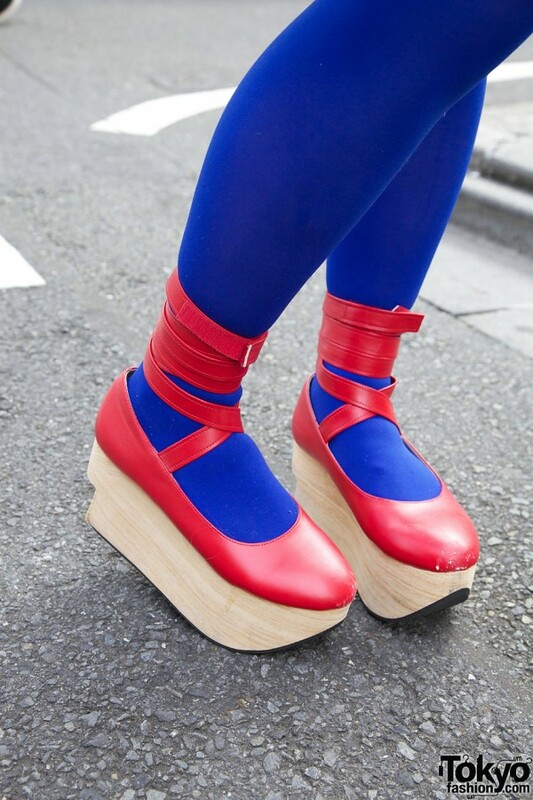 and these very pokkuri/okobo-like shoes, a style that is very popular in Japan just now and that you will see numerous girls wearing in Tokyo. 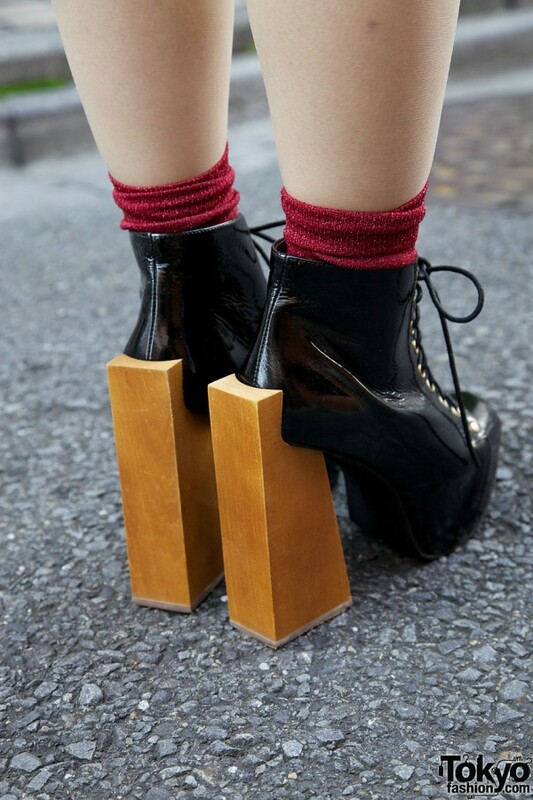 I really like their big nod to traditional Japanese footwear, making it live on in contemporary fashion. To see much more like this, check out TokyoFashion.com, which is where I found those pictures. I have just bought one of these fun hats for winter; I find the extreme cold of winter is a good way to get away with wearing something silly and quirky, even at my age. I have bought the wolf hat and am considering the racoon hat too. I’m also considering this cute Elmo hat. My daughter and I love this Iron Man ski mask, which I think would be great for her fiancé, who cycles to work. I also want just bought this pair of perfect winter boots that I found but I can’t yet afford am still reeling a bit at the £140 £112 (approx. $221 $181) I paid (I got a 20% discount voucher), as I still really can’t afford them. I actually bought them at full price but, when I went back to look at them shortly after my purchase, I noticed there was a discount voucher code, available for the next three days, that I’d overlooked, so I cancelled the order and bought them again with the discount applied. Feeling 20% less guilty now. 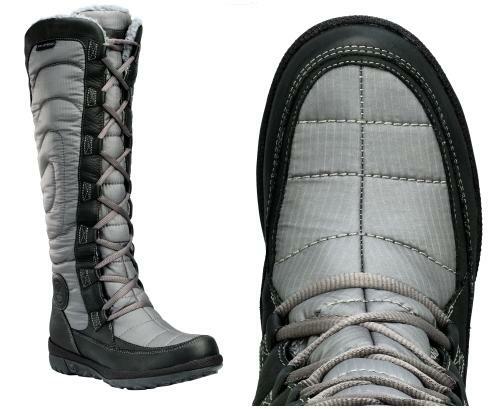 They have a cozy fleece lining and are waterproof and, best of all, are very long; it is so hard to find warm, waterproof, winter boots that go right up to the knee. They’re a mix of waterproofed leather and waterproof nylon. I already have two great pairs of equally expensive winter boots, which are also furry lined and waterproof but they only go up to just above mid calf and, although I love them, I would love them so much more if they kept my entire calf warm by going all the way up to the knee. One pair is black and the other is white; they are a mix of thick, plain leather with patent leather straps and round the toes (you can see me wearing the white ones in the photo of me building a snow Kid Robot, below the grey boots) but otherwise both the pairs I have are the same; all three pairs are Timberland boots, the two shorter pairs are called Timberland Mukluk Barometer. I think of the white ones as my Storm Trooper boots and the black ones as my Vader boots and, no matter how cold it gets in winter or how long I spend out in the snow, they keep my feet toasty. Now I really, really want have bought these long pink ones too. I’ve just discovered that the mauve and black boots are actually grey and black, the site with them just had a badly coloured photo but I found them on the Timberland site. Now buying those too, while the discount is still available so I can get the 20% off them too, then I can choose one pair when I see them and return the other…. probably. Rats, can already feel myself wanting both but I really can’t keep both. The grey ones can be seen below the pink ones. Can teeth be too perfect? Another thing I discovered was a place that offers to make perfect teeth look more crooked. Apparently some Japanese people are intimidated by perfection, so some folk are having their perfect teeth made to took slightly imperfect, in the hope that they will become more appealing to those who were intimidated by their previous perfection. 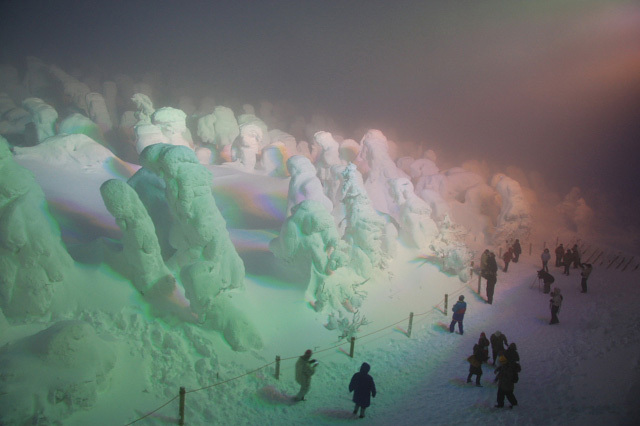 Ah, Japan… full of surprises. While I dislike those absurdly white, almost strobing teeth that so many in the USA seem to admire and I don’t balk at slight, natural imperfections in the lie of the teeth, which they seem to abhor, I do find it odd to dislike and remove natural perfection. I think the are clip-on, so no actual harm done. You can see a site offering imperfection creation for teeth here. Saturday was a beautiful, sunny day here in Scotland, so I made the most of it and had a photo session to get pictures of a few of my Japanese haori kimono jackets. Astrella modelled them all for me, sweltering in the heat without a word of complaint. We took 331 photos and I have selected 58 for you to feast your eyes on here. The pictures may help you gauge the general length of them, as haori are longer than many people realise from pictures of them just on a hanger. Astrella is five foot one inch tall (roughly 155cm) and a UK size 10 and about 125 cm from wrist to wrist. The first haori shown below is covered in large, pink and white ume (plum bossom) and shows how good haori can look when worn with a belt, which is something the Japanese don’t do. They wear them unbelted on top of a kimono and obi. You may notice that haori (and kimono) sleeve seams lie down the arms a bit, not up at the edge of the shoulders. The traditional way of fastening a haori, if one chooses to fasten it at all, is with a single tie, just inside the fronts, called a himo, which holds the fronts edge to edge, not overlapped. As you can see, though, from photos on this page, haori do also look extremely good with a a belt added. The first one below is being worn with a wide elastic belt. This next one has magnificent textile art of bright flowers on black, shown modelled with a narrow leather belt as well as without a belt. The large white stitching at the edge of the sleeves is called shitsuke and is often put in, by the Japanese, just to keep garment seams neat during storage. It is simply pulled out before wearing but, as this haori was just being modelled, I left it in. All but one of the haoris in these photographs is pure silk, inside and out, and all are entirely hand tailored, with the seam edges completely hidden in the lined ones, so those can actually be worn inside out too. Some have hand applied textile art. The quality of the fabric and workmanship is absolutely exquisite. The following photograph shows a haori in a pretty pink, with a design of magenta leaves. Now a touch of 1950s pattern. Shown, in one photo, inside out. The bottom half is usually lined in the same silk used on the outside, with a lighter weight silk on the top half and the sleeves. This haori’s upper lining has a lovely design of colourful parasols on it. Graduated pampas leaf pattern on russet. The leaves become more dense towards the bottom. Bingata style print of pretty flowers. The one below has autumn maple leaves, shown with and without a belt and shown inside out, with the beautiful lining on show. Haori are usually so exquisitely made, with hidden seams and hand tailoring, that you can wear or display the lined ones inside out. The lower half is lined with the same silk as the outside and the upper half and sleeves are lined with a lighter silk in a different design. This one has lovely Japanese parasols on the upper lining. In the next photo you can see how beautifully they are made, with the edges of the seams completely hidden inside and out; not a line of stitches in sight in the lined ones. On the next haori you see a wonderful design of stylised kiku (chrysanthemums) swirling over the silk. Now black, with striking, champagne gold, metallic urushi (lacquer covered silk thread) woven to create a landscape design. An iro muji (self coloured), scarlet haori, with flowers in the damask weave of the silk. I do wish I’d ironed it before the photos, though. They usually aren’t creased when unfolded, as there is a special way of folding haoris and kimonos to ensure they very rarely require ironing when unfolded for use. Swirls of dragon fire on black silk, with subtle touches of gold detailing that are lovely when up close. A 1930s haori, so slightly longer than most of my more recent ones, with slightly deeper sleeves too. Big, pink butterflies on black. Vermillion flowers and leaves on black. Now for two examples of kuro muji (plain black) haoris, with patterns in the weave that the photos haven’t picked up. Each has one white mon (crest) at the centre of the back at shoulder level. This second plain black one, below, is an antique haori, which are often longer than more recent ones. This one is 102cm long. I am keeping it for myself. An unusual one next. It’s a large sized, child’s michiyuki jacket but big enough for an adult to wear. It would fit a child because children wear them with big tucks loosely stitched in the shoulders, narrowing the width. Children’s ones have a collar and tassels, whereas adult michiyuki usually don’t have either of those and would also be longer than this one. The michiyuki you see in the next two photos is made of shibori patterned silk, with little red dots all over and large ume (plum blossom). Shibori is an intricate tie dye process, usually painstakingly, entirely hand done, making it a frighteningly expensive fabric that is highly revered by the Japanese, so this garment would have been for a child from a family with a great deal of money. 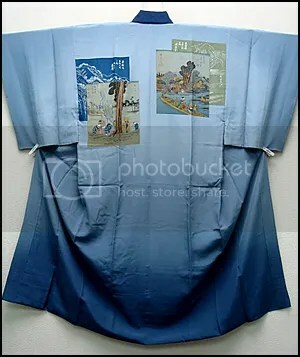 In Japan, haori jackets are not worn with the fronts overlapping and not worn with a belt but michiyuki jackets are worn overlapped at the front and they are usually fastened with press studs, which in itself is unusual, as almost all traditional Japanese garments are fastened only by tying; using using various sashes, cords, obis etc. 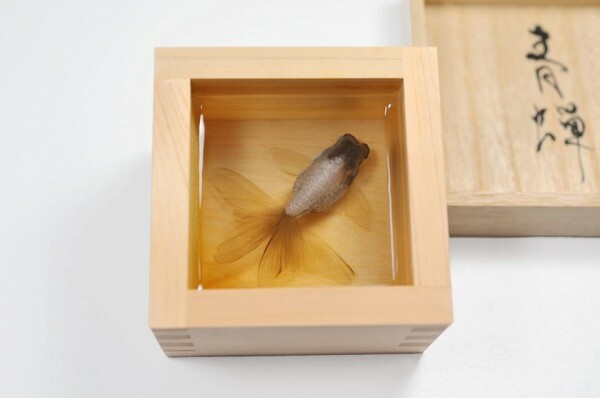 Urushi is Japanese lacquer. It has many uses and one is in textile design. Thread, usually silk, is coated with lacquer, then used to weave beautiful textile art. Textile with urushi weave is found on some kimonos, on obis and is particularly popular on haori kimono jackets. You can see several urushi haori here (and hundreds more on my website). Urushi is sometimes just a coloured lacquer but often it’s metallic, found in shades of gold, silver, pewter, copper, bronze and a whole rainbow of metallic colours. On some garments it is quite subtle, on others it is bright and spectacular. While kimonos may have a somewhat limited use in the West, mostly worn at home as robes, haori jackets are very wearable with western clothing. Haori are wafuku (traditional Japanese clothing), designed to be worn over kimonos, but are lovely worn with yofuku (non Japanese style clothing), looking wonderful worn casually with jeans and the like or dressed up for a special occasion. The designs make them extra special and urushi ones are real eye catchers. Each year in Japan there is a celebration called Seijin-No-Hi (sometimes seen as seijinsiki), now usually held on the second Monday of January. No matter where you are in Japan on this date you will see many girls, dressed in their traditional kimono, out and about celebrating Seijin no hi. The celebrations are organized by the local government of their place of residence. Styles of these ceremonies are different from region to region. Many of these young women have their hair and make up done by a professional and have a photographer take a commemorative photo, just as we might when dressed for a university degree ceremony. Seijin-no-hi is a coming of age ceremony for girls who have reached the age of 20. 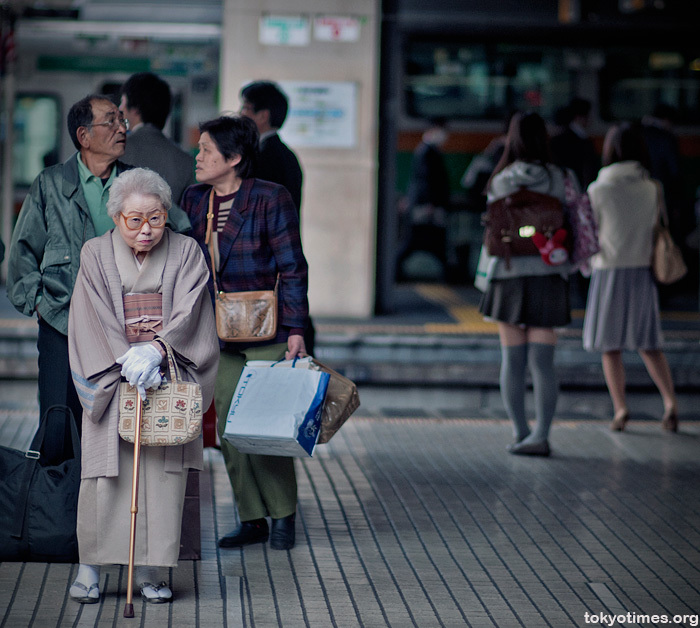 At this age, they are considered adult and can legally vote, smoke, drink etc. It is meant to be an auspicious event to celebrate and encourage people who realise that they have become adults and have made up their minds to live their lives independently. 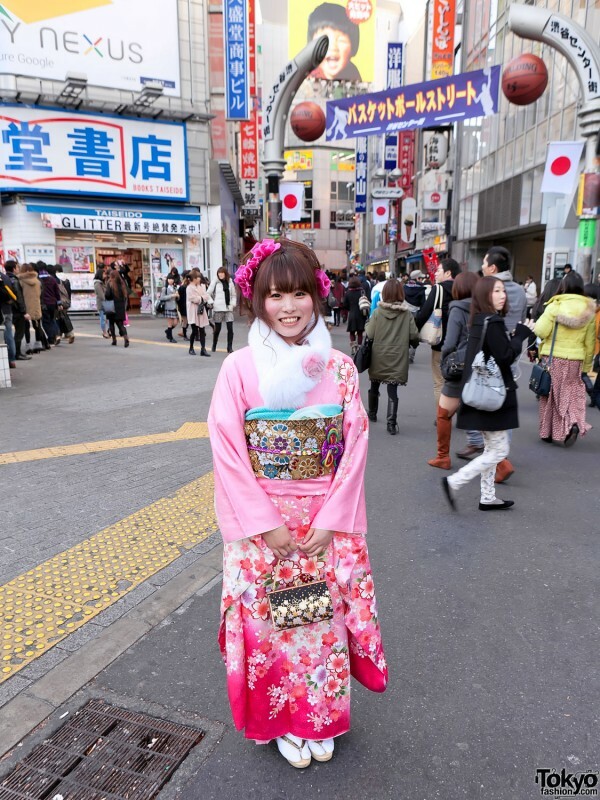 In Japan, the 20 year old women dress in beautiful furisode kimonos for that day. Furisode is pronounced foo-ri-so-day, with no stress on any of the syllables. Furisode kimonos are very ornate and have exceedingly deep sleeves. The beautiful furisode is usually bought for them by their parents, at a cost of thousands of UK pounds for a silk one, plus as much again for the obi, obi accessories and such. Nowadays they sometimes just hire the outfit for the day. The Japanese have a saying that translates as, ‘have three girls and be broke’. Girls used to be taught by their mothers how to on put their kimono and obi, which is a time consuming and difficult task, but this tradition has largely died out, so they usually now go to classes to learn how to put it all on and how to carry themselves when wearing it or have a dresser to help them on the day. Furisodes are astoundingly beautiful kimonos when on but they also make spectacular display items, either on an ikou (special kimono display stand) or on a wall, hung from a kimono hanger or bamboo rod, back view with the fronts pulled out and pinned to the wall or clipped (like in the next photo, below) to the sleeves. The furisode comes in three different sleeve lengths: oburisode(full; 105 cm), chuburisode (medium; 90 cm), and kofurisode (short; 75 cm). The ones shown here are all oburisode, the deepest sleeved furisodes. 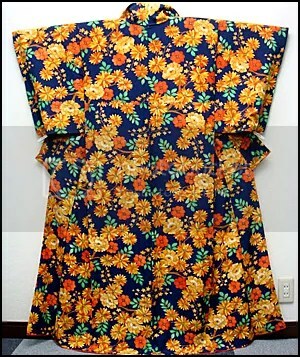 Below are some examples of the furisode kimonos on my site. Where you may see a break in the pattern at the back, this area is hidden when on, by the waist fold and obi. This pink one has pretty clouds floating across it, a very popular motif in Japan. The pale yellow one below has trailing flowers and lovely, gold, kinkoma couched embroidery detailing. The green floral one below also has gold detailing. The photo doesn’t do it justice, it is exquisite when on. The furisode below is a pretty, soft green colour, with wonderful flower sprays in shades of pink, white, blue and green. Finally, the furisode below, one of my favourites, has a dramatic design of tabane noshi and flower baskets, with pretty embroidered detail too. Tabane noshi is a decorative bundle of strips, originally narrow strips of dried abalone/mother-of-pearl bundled together in the middle; it was the ritual offering to God in Japanese Shinto religion. Tabane noshi is now also is used to refer to a bound bundle of any kind of ribbon strips. This motif is often seen in the masterpieces of furisode kimonos from the middle of the Edo era, created by various techniques. It remains a very popular motif in Japanese design. When you think of the quantity of silk used to make these furisode, which are usually fully lined in silk too, and the fact that they are almost all hand printed and entirely hand tailored, it is hardly surprising that one will pay at least £3000 for the kimono alone. The kimono above is a lovely, silk furisode kimono. Furisode (pronounced foori-so-day) means ‘swinging sleeves’ and this style of kimono has extra deep sleeves and is worn by young, unmarried women, from about the age of 20. Once married, they replace it with a houmongi kimono, which has much less deep sleeves. This one has the most fabulous embroidery on it; great big butterflies. The lining is foxed, that is, it has yellowish brown spots on it, a characteristic sometimes seen on vintage silks, especially the ones used for linings. It doesn’t weaken the fabric, it just discolours it and that doesn’t show when it is worn. The photos don’t really do that furisode justice, it is much nicer up close. My daughter’s scarlet hair goes well with so many of the kimonos. I’m most annoyed with the UK Post Office. A parcel sent to Germany went missing (I since insist on sending overseas mail as insured, registered mail), so I put in a claim for lost mail, even though I will get £34 back at most, when the contents’ value was £120. The other day I got a letter from the Post Office, asking for my original receipt for the contents, saying I had 5 days to reply or they would consider the matter closed. What annoys me about that is that it took them 7 WEEKS to send that reply to me. I told them, in my reply, exactly what I thought about that! Now I’m going to take a 30 minute nap, having got little sleep last night, then it’s time to make lunch, after which I will pay another customs’ import tax bill for kimonos I’ve bought from Japan. I’ve marked the break on the X-ray. The ball top part of the humerus is in the correct position. The pink line indicates the break at the base of the ball. The lower part of the bone is pushed up and over to the right, the broken end marked with a green line. The green and pink lines should sit exactly on top of one another. I am furious with the Post Office. I sent a package to Switzerland and I asked the woman at the Post Office counter if I needed to put on a customs label, as, although in Europe, Switzerland is not part of the EU. She insisted I didn’t need one. The package arrived in Switzerland and, because it had no customs label, Swiss customs had to get in touch with the addressee and find out the contents and their value. Their value was low enough not to require import duty but, because the lack of customs label meant they had to contact the addressee, she was charged about £13 administration fee by them, which I have to reimburse. I will be complaining to the UK Post Office and insisting that fee is refunded to me, as there would have been no fee if there had been a customs label on the package. I wonder how successful that will be. I am not a happy bunny! I spent last night preparing photos of kimonos etc. I brought a few stacks of them downstairs to my sitting room to force myself to work through them. I have so many that I forget what I have, so listing a new batch on my site is nice, as I get a chance to look at them again. I promised myself I wouldn’t buy any more, as I have thousands of items, but I weakened and bought three more pairs of pretty zori. What I do need to buy is cellophane bags, as I’ve run out of those and I put each garment into one. Below are two of the silk kimonos I photographed tonight; one woman’s kimono and one man’s juban kimono. A girl from Glasgow University’s Japan Society contacted me on Facebook to ask if I might help at one of their meetings, where they planned to dress people in yukata kimonos and take photos. She wanted me to come in full kimono outfit and I would have been happy to but I don’t visit Facebook often and got her mail there too late. Maybe next time, as I am fond of Glasgow University and their Japan Society people are nice. I can hear an owl hooting outside; it’s now nearly 4am.